This dyed turquoise Howlite gemstone is a strikingly beautiful shade of vivid blue. Howlite in its natural state is a white stone with similar patterns as turquoise. Because of Howlite's porous texture, it can be easily dyed to imitate other gemstones. The stone has been polished for a high sheen and framed by a special design sterling bezel. The bezel is a step-design pattern with a slight serration to its edge. The bezel was cut, edges filed, and the ends soldered together for a perfect fit around the stone. The bezel was polished to a brushed finish. The back of the pendant is open for full viewing of this lovely stone. The inside of the bezel is secured with a strong two-part epoxy glue to hold the stone in place. A sterling jump ring is soldered to the top of this bezel for accommodating a sterling textured bail. This pendant necklace is made with cherry wood. The round brownish red wood pendant has a butterfly flower and leaf pattern intricately laser cut into the surface. The antiqued copper flat link chain matches beautifully with the pendant. An absolutely gorgeous piece! The pendant measures 38mm (approximately 1-1/2 inches) round. It is very lightweight making the necklace comfortable to wear. The antiqued copper flat link cable chain is 19 inches long and fastens with an antiqued copper lobster clasp and tag. Included is a white cotton filled box enclosed with a cardboard chain card shown in photo 4. This necklace is a wonderful gift for the nature lover or buy it for yourself and enjoy. Are you looking for a beautiful statement necklace for this spring and summer? How about this delightful Boho necklace and earring set? The jewelry would make an excellent gift for her! The lovely gemstone necklace and earrings are a pretty light blue and are perfect as a birthday gift. This gorgeous pendant necklace features an artisan made polymer clay flower pendant. The necklace is 16 inches long and closes with a pretty leaf toggle clasp. This necklace is made with a strand of blue chalcedony gemstones. The pretty minimal earrings are 1.5 inches long and look perfect with the necklace. Photograph Titled "Beautiful Little Nightmare" is a photograph of a Tarantula Hawk resting on the Desert Milkweed blossom in Sunnylands Estates. I think these are so beautiful, with a silky ebony body with iridescent golden wings this insect is as pretty as a butterfly. But after reading a bit one would look at this beauty with a different eye. The Tarantula Hawk will stun a tarantula to paralyze them then lay their eggs on the tarantula's abdomen. When the pupa hatch they hungry and find they are living on a buffet! While I am sure a tarantula see them as terrifying murders I still think they are beautiful. This adorable fun dragonfly charm bracelet is an accessory for your wrist during the Summer Season. A beautiful silver and blue pearl bracelet that can be worn with any outfit. Looking for that special gift for Mom or Grandma on Mother's Day ? This is the gift ! * A beautiful bracelet that is handmade using silver plated dragonfly charms, silver plated chain, silver filled beads, Swarovski light blue crystal pearls, Swarovski light blue and crystal beads. Silver plated bead caps have been added to the pearls for a feminine touch. What a gorgeous combination of colors. If you or someone you know loves flowers specifically Pansies then this is the perfect home decor type gift to get for yourself or that friend. 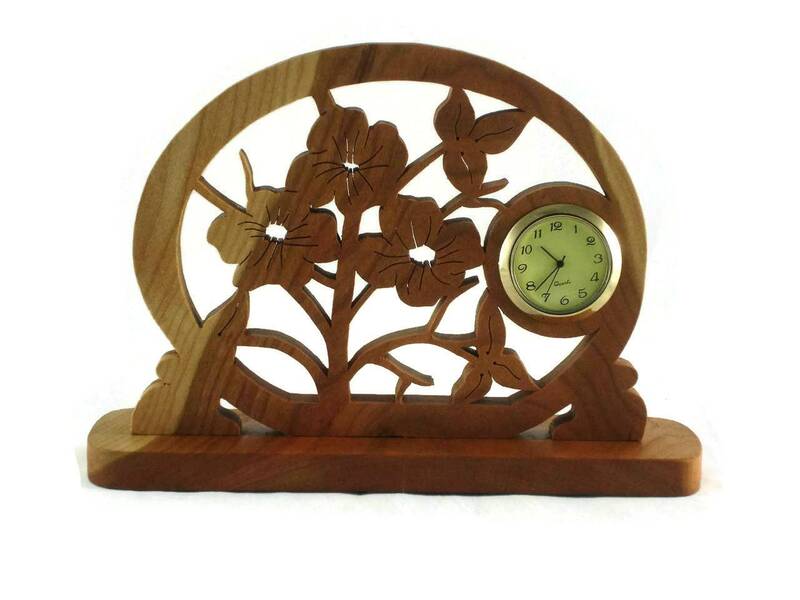 This wooden Pansie flower themed desk or self clock was cut from 1/2 inch cherry wood by hand ( handmade ) using a scroll saw. This pansies deck clock features three pansy flowers cut out of the center portion of a oval type shape with legs on the bottom. There is a base screwed to the leg portion for added stability. A non toxic all natural homemade bees wax and mineral oil finish was applied to naturally bring out the true and natural beauty of the cherry wood. The 1-7/16 inch mini quartz clock features a ivory color face with black Arabic numbers. A gold plated bezel and a stainless steel back battery cover. Clock comes with battery installed and is ready for you to activate it. If you are a woman who loves dogs, you will definitely love the perfectly named MY BEST FRIEND handmade dog rescue earrings. The one of a kind earrings feature artisan created ceramic charms in aqua with an inscribed dog in brown and white on the front. A luminous Czech glass bead in aqua, clear and gold caps each dog charm along with copper discs. Earrings that are a perfect gift idea for the woman who adores her dog(s), especially if they are rescues, the meaningful MY BEST FRIEND earrings were carefully designed and handmade by Catherine of Shadow Dog Designs. *** Please note: when sold, one half (1/2) of the purchase price of the MY BEST FRIEND earrings will be donated to an animal rescue society to care for the four footed souls waiting for their furever home. An exquisite vintage light amethyst brass earrings. With the color of the year being Ultra Violet I had to use these gorgeous vintage light amethyst glass stones which enhances the brass filigree teardrop dangle perfectly. A romantic yet fun pair of earrings for every day use. *I am in these earrings. They are Victorian style and romantic while remaining lightweight and easy to wear. Paired with a brass lever back ear wire and a Swarovski vintage amethyst glass stone(which sparkles in every light). The brass filigree teardrop links are lead free and nickel free. The links are also hollow in the back. This is a beautiful pendant and dangle earrings jewelry set made of dichroic fused glass. The color is a fabulous Caribbean ocean blue that looks like blue fire as the light moves across it. If there could be "blue fire", this would be it! There is a soft blue glow in these pieces of dichroic glass. The blue cabochons display shading from cobalt blue to sky blue with hints of green and gold! 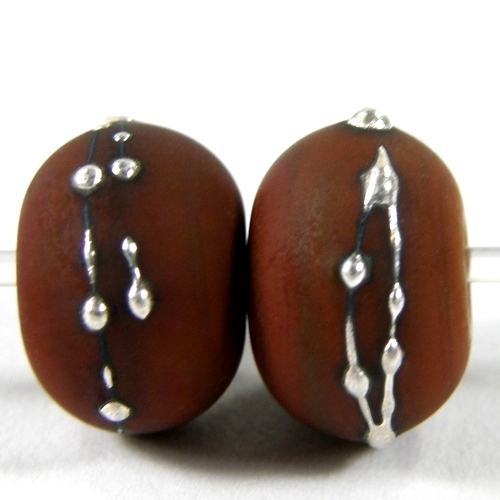 There is a striated pattern that runs horizontally across the cabochons. It is fully capped to create amazing depth of form and color. Catch on fire and cool off with this pretty jewelry set! The rectangular dichroic pendant measures 1.5 inches long, including the bail and .5 inches wide. The bail is a pretty silver plated bail with a small opening. The earrings measure .5 inches square and are mounted with silver plated bails and beautiful sterling silver ear wires that have Swarovski crystals at the bend. The crystals add a bit more bling to the earrings that dangle nicely and flash in the light! This adorable little Baby Sweater and Hat were both Crocheted using alternating rows of Blue and White Baby Yarn. The size should be perfect for a 3 - 6 mo old infant. The sweater and cap were made with Pastel Blue Baby Soft, which is a mixture of acrylic & nylon; the alternating rows are White Softee Baby Yarn (100% acrylic). Although both items are machine washable; it would be preferable to hand wash and block the sweater to keep its shape. The sweater is closed by 5 little blue bear buttons; and the cap is topped off with a cute little pom-pom! Note: My grandson, Zachary (2 mo) is modeling the same sweater set in mint green. Color available upon request, and availability of color. Filet Crochet Design of 2 Birds with their Nest - I added colored outlines in Threads to emphasize the Drawing. The Whole Filet Crocheted piece is in Camel Tan - the Branches are outlined in Green, the Flowers are outlined in Garnet Red - and the 2 Birds and the Nest are outlined in Dark Red Copper. See All Photos for the Details! - The Second Photo is a closeup showing the Top of the piece - with the Edging and the Top of the Design around the "Bird Nest" - and the Birds and Branches with Flowers. - The Fourth Photo is closeup showing the Bottom of the Design with the Bird perched on the Nest. This Aqua Dragonfly Bracelet is the perfect gift for the woman who loves the symbols of the dragonfly, butterfly and the tree of life. All of these symbols mean change; the dragonfly has wings that respond the the wind, the butterfly changes from a cocoon and the tree of life is the cycle of life for your family. 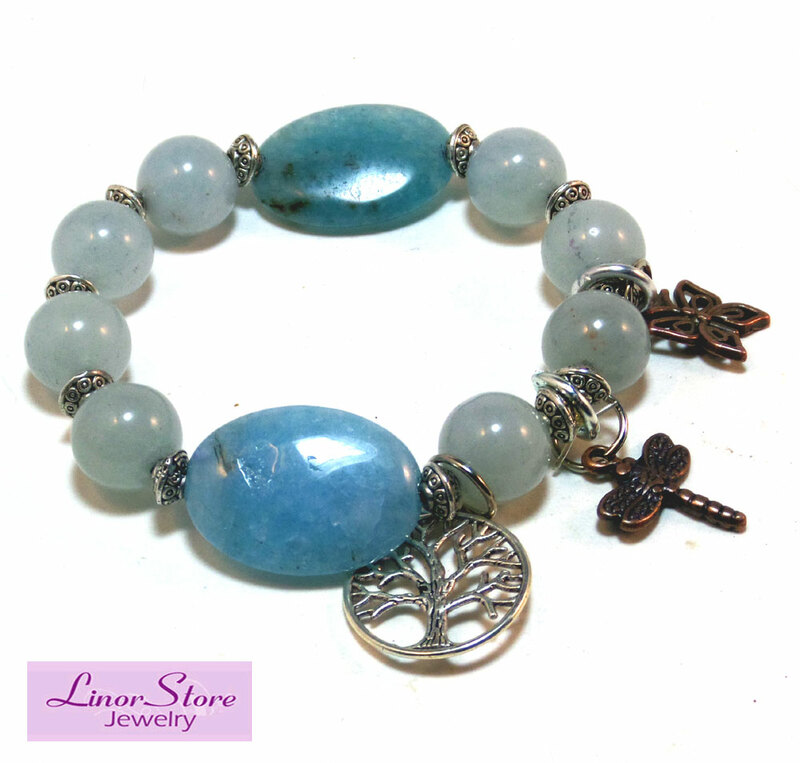 You can give this Aqua Dragonfly Bracelet as a gift (to yourself) or to a friend to symbolize change. It is on stretchy cord and will fit a size 7.5. Aqua Dragonfly Bracelet has blue jade gemstones – round and oval, silvertone spacers and the charms: the dragonfly, butterfly and the tree of life and is made with positive energy. This beautiful butterfly stitch cloth is hand knit in 100% cotton yarn and measures approximately 9 inches by 9 inches. The cloth's colors will compliment any kitchen or bath in blues, greens or browns. You could make this a unique gift by adding a lotion or butterfly soap from one of our Etsy artisans. As always, machine wash in cold water and tumble dry on a low setting to minimize fading and shrinkage. Perfect for nature lovers, this fox woodland necklace is an eye-catching handmade piece featuring an artisan-made fox pendant, blue sponge quartz, silver freshwater pearls, crescent organic seeds, and sterling silver beads and clasp. The pendant was made by a talented polyclay artist in the USA, and is stamped with the outline of a sweet fox sitting with its tail curled around its paws. The fox is outlined in brown with silvering throughout its body, and the background is a bluish teal. The effect is very charming, and the pendant should delight anyone who loves foxes, like me! • Silver to enhance the fox's color and also suggest winter or moonlight. Thank you Colleen - a beautiful collection of "Blue" items for Mother's Day! Your Blog shows the talent of the many artisans featured! 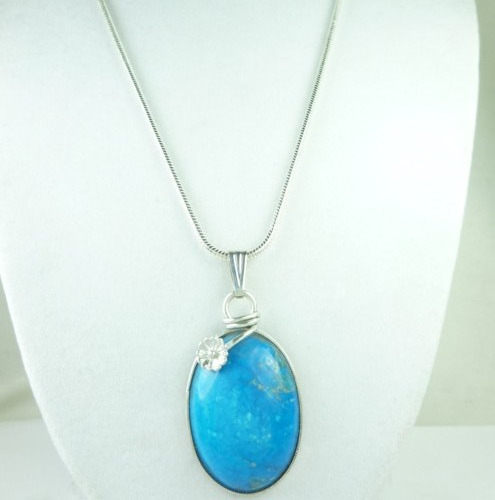 Thank you Colleen for including my turquoise howlite pendant in your Blue Gift collection for Mother's Day. Will share.